The first monument of the year is the perfect opportunity for a team to kick off their season in style. And with the modern cycling season being so long, many riders have been racing for a month or two already—so we had plenty of time to get excited for this year’s Milan San Remo. 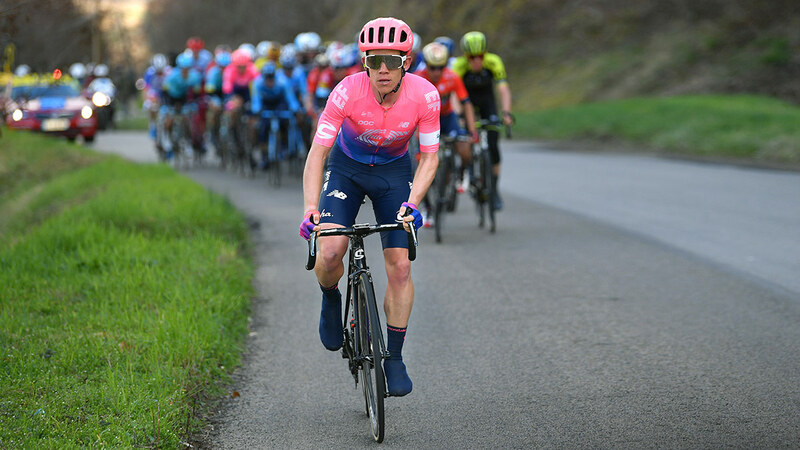 Lawson Craddock was one of EF Education First Pro Cycling Team’s key riders in the 2019 race. With the designated team leaders Simon Clarke and Alberto Bettiol, the rest of the team was responsible for bringing the duo to the closing 25km in the best possible position—and to ensure that they used little energy as possible. The initial kilometers of the race had a very similar script compared to previous years. A group of 10 riders from smaller teams went clear right away to spend the next 6 hours in the breakaway. In these opening kilometers of the race, it was Julius van den Berg and Dan McLay’s job to keep the riders out of the wind and safe before the peloton hit the coastal climbs with 50km to go. 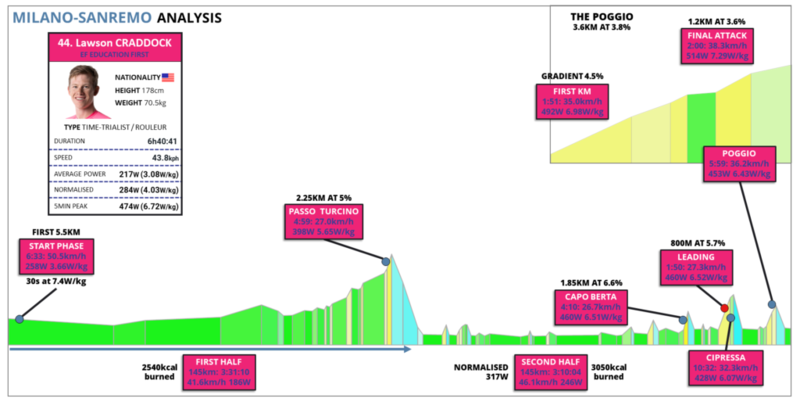 For the field, the next 3 and a half hours were characterized by a moderate pace; it is only 140km into the 290km race that the riders tackle the first obstacle, the Passo Turchino. This was done at a somewhat sedate effort for Lawson. The tension within the peloton started to mount as the bunch hit the coast road, signaling the start of the fight for position. It was on these narrow and twisting roads en-route to San Remo that Lawson took over the responsibilities at the head of the peloton. With the likelihood of crashes always a very real possibility at the point of the race, his energy expenditure was all in the name of safety and positioning. The first of three crucial climb in the final kilometers of Milan San Remo is the Capo Mele. Usually, this is the first climb that causes a few riders to drop off the peloton. It is followed by the Capo Ceve; and the steepest of the three, the Capo Berta. Although these climbs rarely play a crucial role in the selection for the final, the pace is held high on and between the climbs to maintain the team leaders’ positions at the front. It is also a time when splits in the peloton can happen due to crashes, making those safer positions at the lead of the race even more competitive. Effort rating: 3 out of 5. Fast, but sustainable for Craddock on the first Capo. Effort rating: 2 out of 5. The pace drops on the second climb and Lawson could reserve some energy. The effort on these climbs was still manageable, but climbing at 30kph puts the riders under noticeable stress. With the two small climbs out of the way and with Lawson and his teammates visible at the front of the peloton, the next obstacle was the Capo Berta. It was here that the peloton really started to eat into the remaining lead of the breakaway, which was still dangling off the front and fighting for glory. Effort rating: 4 out of 5. Everyone digs deep on the third of the small Capos, no rest allowed. Not only was the average pace high on the Capo Berta, but Lawson had to produce several anaerobic bursts between 600 and 800w (8.5-11.4w/kg) for up to 15 seconds as he accelerated out of corners and past other riders. In the four minutes of the climb, he rode 11 such efforts—all of which would have been significantly taxing after over six hours in the saddle. The approach of the Cipressa is infamous for its furious speed and hectic fights for position. In the 4km before the climb, Lawson averaged 50.8kph, maxing out at 70.5kph for 4:44min. He averaged 320w, 4.53w/kg, even in the draft of the field. Again, he was forced to produce multiple short, hard accelerations, using up his energy to keep him and his team leaders at the front. On the Cipressa, Lawson could be seen driving the pace as the Peloton caught the remainders of the early breakaway. The Cipressa has been pivotal in the past, either in decimating the field or as the launching point for a few successful long-range attacks. This was not to be the case in 2019, however, as all the main contenders were trying to save their energy for the final on the Poggio. Because of its length of 5.6km, it is possible to expand a lot of unnecessary energy on the Cipressa, particularly as a team leader out of position. Lawson’s data shows that he made a concentrated effort to be at the front for his team on the climb and it was here that he produced some of his peak powers up to this point: His acceleration at the head of the bunch saw him hit his peak 30sec power for the day, 639w, 9.15w/kg and he averaged over 6w/kg for the whole climb. Looking at the average speed of 32.3kph on a 4% gradient shows how fast the peloton was going on the Cipressa. Effort Rating: 4.5 out of 5. The longest hard climb, and Lawson is at the front. Fatiguing! The showdown was set for the Poggio with all the favorites still present in the front group. Twisting turns and varying gradients make it a great spot for a decisive attack less than 10km before the finish line. But before the field hit the slopes of the final climb, it was again a big battle on the flat to get into position and be as close as possible to the front. With the tension within the peloton at fever pitch, this is the most crucial time of the race. In the 2km leading into the final climb, Lawson averaged 371w, 5.26w/kg for 2:26min at a blistering speed of 51.5kph and hitting a top speed of 71kph. On the climb itself, Lawson produced his peak powers, from 1min right through to 6min in the battle for a good result in the first monument of the season. It was only with 1km left to go on the climb when eventual race winner Julian Alaphilippe (Fra) Deceuninck-QuickStep took the opportunity to close the gap to Lawson’s teammate Alberto Bettiol, who had attacked earlier. The remaining peloton split at once and an elite group of eight riders forged clear. It was during this acceleration by the Frenchman in the close 1.5km of the hill that Lawson produced his peak 1-2min powers, staying in the top 20 to 25 riders. Effort Rating: 5 out of 5. A huge effort after 6:30 hours of racing, especially on the last kilometer. The run into San Remo was ferocious. A large selection of riders had made the front, and would go on to fight it out for the win. Within this elite group of rides was Simon Clarke (Aus) EF Education First, who would finish with a fantastic 8th place. It was a perfectly executed plan by the EF Education First team. The intensity did not end for Lawson as the passed the final climb. On the flat 2.3km run into the finish, Lawson still had a very painful 394w, 5.64w/kg with an average speed of 51.7kph and a max of 71kph. This was a fast end to a 290km day in the saddle, and a successful outing from the first big classic of the year by EF Education First.